28 tooth close ratio second gear used in all close ratio Toploaders. 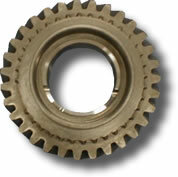 Replaces Ford part number C4AZ 7102-D.
31 tooth second gear used in all wide ratio toploaders. Replaces Ford part number C4DZ 7102-A.